Swarovski Crystal - Diamond Leaf Flat Back 10x5 mm in AB Aurore Boreale. Our jewellery is handcrafted by us in the UK. It does not have Swarovski swan logo as they restrict its use to their own end products only. Beautiful ring, perfect for any occasion or outfit! (actual colour of item may vary due to screen resolution settings). US:, 6.5, 8, 9. Model: Attract Set 5113468. Authentic Swarovski. The earrings in the set are not hallmarked due to their size and design but are genuine. Earrings Size: 0.4 cm. Chain Size: adjustable between approx 35 - 43 cm. GBlack diamond crystal pendant on ruthenium plated link chain necklaceItem number: 903642. Item Number 1039088. Swarovski Laureen Black Diamond Crystal Ring. 100% Genuine - Swan Marked - Excellent Condition. Featuring a large Black Diamond crystal in a prong setting, it is also adorned with wonderfully sparkling Clear crystal pavé. The trio ring is 20 points. Each has a solid 925 sterling silver band. Trio Black Diamond and SWAROVSKI Ring Size UK L. Plus two crystals made with SWAROVSKI ZIRCONIA. Ring set with a black diamond. Authentic Swarovski Crystal Meteor Ring Black Diamond. RRP: £100. SALE! Snowflake Brooches. Ruby Red Earrings. Black earring. Necklaces & Earring Sets. Jewellery Set (Necklace & Earrings). Purple Earrings. Blue earrings. Champagne Earrings. Each of the pendants have Angel inscribed on the leg. Swarovski Diamond Necklace. Dispatched with Royal Mail 1st Class Large Letter. Stunning Large Diamond type Swarovski Silver Ring. in Cm my finger size 6.5cm. swarovski Diamond Ring. Condition is Used. Never really been worn. More or less brand new in the box. Very sparkly and glam. Please see all photos provided. Ring size is small. No returns accepted Thankyou. Dispatched with Royal Mail 1st Class Large Letter. Swarovski bracelet with Diamonds. Dispatched with Royal Mail 1st Class. This necklace features a beautiful uncut white diamond set in a handmade 14k rose gold prong setting. The entire setting and chain are solid 14k rose gold. Eco Friendly and Sustainable: This ring is eco friendly and made from sustainable sources because the gold used is recycled and from non-mined sources. Swarovski Emerald Necklace UNUSED UNOPENED Birthday Diamond Stone. Condition is New with defects. Box slightly scratched as shown but has not been open or worn! Dispatched with Royal Mail 1st Class Large Letter. Genuine brand new women’s Swarovski earrings. Silver. Excellent condition!! Perfect for any occasion! Snowflake Brooches. Ruby Red Earrings. Black earring. Necklaces & Earring Sets. Purple Earrings. Blue earrings. Champagne Earrings. Crystal Elegance UK. Beautiful Swarovski Diamond Rind made in France. Only worn once for the photo! Drop earrings made with sparkling Diamond White crystal from SWAROVSKI® BN!!! Revere Diamond Style Necklace, Hardly Worn, Good Condition. Condition is Used. Dispatched with Royal Mail 1st Class Large Letter. Swarovski Earrings - Diamond-Shaped (New without original packaging but never worn). Dispatched with Royal Mail 2nd Class. 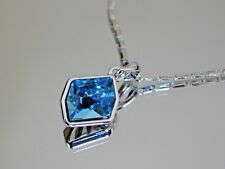 swarovski necklace new woman diamond. Dispatched with Royal Mail 1st Class Letter. Pewterhooter 925 Sterling Silver drop earrings made with sparkling Diamond White teardrop crystal from SWAROVSKI. The fishhook findings are stamped 925 (suitable for pierced ears only). Silver plated crystal settings. Only the rarest of diamonds are truly colourless, most having a tinge of yellow or brown. By comparison, Cubic Zirconia is entirely colorless: equivalent to a perfect "D" on a diamonds grading scale.